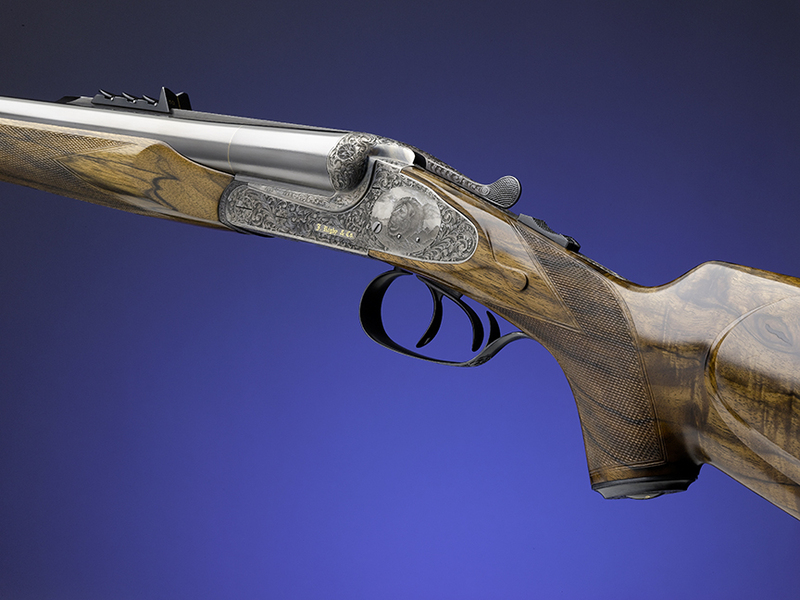 Rigby .470 Nitro Express sidelock, engraved by Silvia Milani, unfired, cased - Sportsman's Legacy, Fine firearms, related books and sporting collectibles. Representing estates, collectors and nonprofit conservation organizations. The recent acquisition of John Rigby & Company begins another fascinating chapter in the history of this storied gunmaker. Born in Ireland, relocated long ago to England and then again to America; it will be interesting to see what the new owners (Blaser) have planned. Those who think of Rigby primarily as the maker of rifles, especially double rifles, are likely to pay the most attention. After all, the doubles turned out by “California Rigby” are among the most elegant and accurate ever crafted. While most of the rifles made in Paso Robles were boxlocks, it was the sidelocks that defined the upper limit of the gunmaking art. 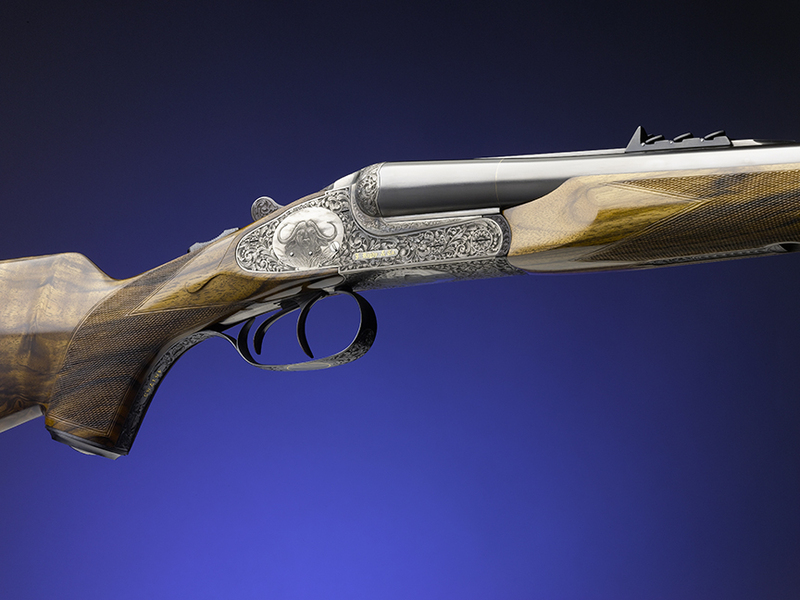 Chambered in the great .470 Nitro Express, this one wears full-coverage engraving by Silvia Milani – an Italian master recognized as one of the world’s finest. The left lock features a full-maned lion bust, the right a Cape buffalo and the bottom an elephant, each surrounded by intricate scroll. The theme continues over the trigger guard, top lever, forend latch, tangs and grip cap. Gold accents include fine wire at the muzzle, an oval initial outline on the guard (blank), serial number, brand and mark. Stocked in staggering exhibition-grade English walnut with a traditional cheekpiece, it also has a semi-beavertail forend, perfect checkering and sling swivel studs. Other appropriate features include express sights with one fixed and three folding leafs regulated for 50/100/150/200 yards, a trap door grip cap and gold line cocking indicators. Never hunted and always carefully handled, it remains in at least 99% condition with only a hint of storage wear.